A recent study by U of A students regarding Edmonton’s 10 best neighbourhoods for millennials ranks Spruce Avenue number 6! “Just toss Avenue Edmonton’s best neighbourhood list — that’s Janna Bradshaw and Stephanie Kovach’s best advice for a millennial who is house hunting. Click here to read the full article and see the map. The Spruce Avenue Community League Board is looking to fill the position of Civics & Neighbourhood Development Director. The Civics & Neighbourhood Development Director monitors the civic concerns of the neighbourhood including new development and infill, Bylaw changes, and permit variances. With the President, the Civics & Neighbourhood Development Director represents SACL at events/consultations with the City of Edmonton and reports to the board on matters relating to development in the neighbourhood. Spruce Avenue is a mature neighbourhood with unique needs and challenges. As the City grows, our demographics are shifting toward a mix of young families and professionals, elderly homeowners, and students. With the City encouraging densification, infill is an ongoing issue. A Civics & Neighbourhood Development Director is aware of the development that is being proposed, can keep our board and residents up-to-date, and can communicate our neighbourhood’s concerns to the City. Knowledge of existing infill development bylaws is an asset, but not necessary! We require someone with clear communication skills who has an interest in becoming familiar with the bylaws. Note: Volunteering on the SACL Board waives your membership fee. The Spruce Avenue Community League Board seeks to replace existing SACL Bylaws (written in 1954, last amended 2008). A new set of Bylaws has been drafted using EFCL’s Best Practice Guidelines as a template. This draft seeks to provide better protocol and structure for our organization by including terms of reference and a policy on board conduct. The draft has been approved by the Executive for consideration, and was circulated to the board on January 23rd, 2018, for discussion. A vote will be called at the April 24th, 2018 Board Meeting (7pm at the SACL Hall) to replace the existing SACL Bylaws with the new Bylaws. Snacks, skating instructors, face painting and more! This free drop in event is targeted to the families who participated in the 2018 Learn to Skate program; however, all are welcome to attend! Skates and helmets are required to participate. Equipment will be available to borrow if you do not have your own. Spruce Avenue residents and property owners are invited to attend a final public meeting about upcoming neighbourhood reconstruction, before work begins this spring. YEG FAMILY CONNECT 2018: you are invited! What: The North Central Interagency invites you and your family to join in for food, resources, haircuts, family photo booth, kids’ activities, and more! WHAT’S NEW IN SPRUCE AVENUE? You may have noticed that the skating rink lights are shining a little brighter. As the light poles were beginning to show corrosion and had exceeded their expected use, the Spruce Avenue Community League Board replaced the ten poles with galvanized steel and ten new energy efficient LED floodlights. Community league casino funds were used to apply for matching grants to the Canada 150 Infrastructure Program and the City of Edmonton Community League Infrastructure Program. Without this funding this project would not have been possible. For over 65 years the outdoor community rink has been the centre of activity for families living in Spruce Avenue and surrounding communities. The rink continues to be enjoyed by our residents, as well as students attending Spruce Avenue School and St. Basil School. Hopefully the enjoyment will continue for years to come. Our community was fortunate to receive a donation of twenty-five oak and maple trees for the park area. The trees were planted at the end of September and involved Grade 7 students from the Spruce Avenue and St. Basil Schools. A huge thank you is extended to Roots for Trees, City of Edmonton Forestry, and the Canada 150 Committee for making this possible. This will not only will beautify the area but also provide much needed shade. It’s a great start to SACL’s desire for trees in the playground area. Stay tuned for upcoming community meetings regarding Neighbourhood Renewal. Decorative Street Lighting Initiative: Spruce Avenue was not successful in demonstrating community support for the Decorative Street Lighting option as part of Neighbourhood Renewal. As a result, the standard galvanized street poles will be installed in our neighbourhood. Learn and practice your skills through fun games and activities. This is a free drop-in program targeted for children ages 6 – 12 and their families, however all are welcome to attend. Children must be dressed for the weather conditions and have a helmet and skates. Want to participate but can’t afford equipment? Call Verna @ 780-479-8019 for a referral to Sports Central for skates and helmets. Programs will cancel at -25 Celsius with wind chill or if the ice is closed by the facility. For more information, please visit edmonton.ca/playgrounds or call 311. As the casino is the main source of fundraising for the community league, we ask that you consider volunteering for one of the positions listed. 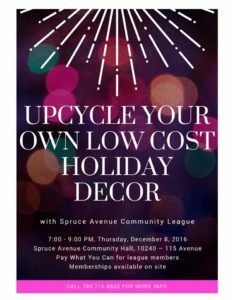 It is an opportunity to contribute to your community as well as meet residents of Spruce Avenue. Casino funds have enabled the league to apply for matched grants in order to complete a number of upgrades and community projects. These include: the re-development of the playground, development of the spray park, addition to the hall, construction of a storage garage, development and maintenance of the outdoor rink, purchase of ice maintenance equipment including a zamboni, installation of a walking trail which ensures access to the playground area from 114 ave, retrofitting the community hall to be wheelchair accessible, ongoing maintenance and repairs to the hall, upgrades to the kitchen and the current development of a parking lot. 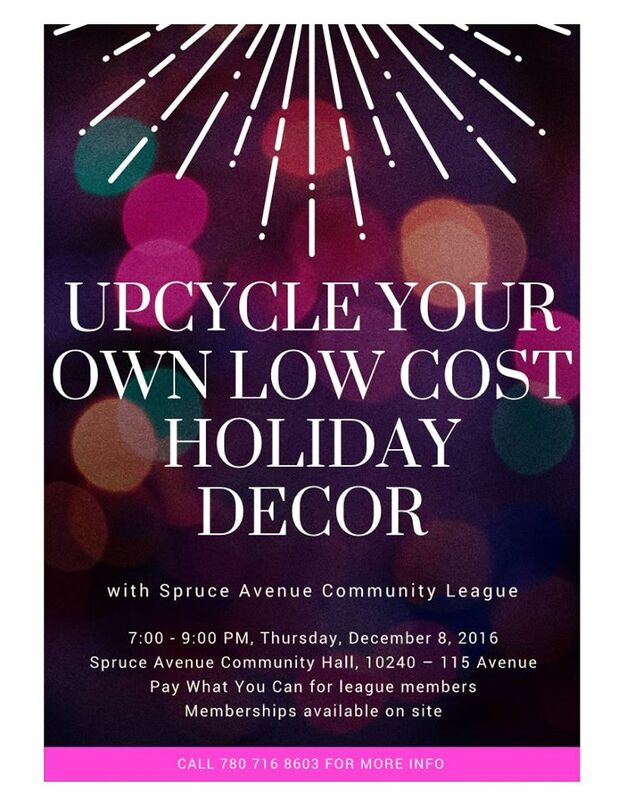 Please contact Verna @ 780-479-801 or treasurer@spruceavenuecommunity.com to volunteer. If you are interested in joining the Spruce Avenue Community League Board, we would love to hear from you. We are currently looking to fill vacant director positions, including Director of Neighbourhood Development. If you are interested in guiding infill development in the community and have some knowledge of existing infill development bylaws, or are interested in becoming familiar with the bylaws, contact us at president@spruceavenuecommunity.com. A huge shout out to the residents who light up our community. The array of holiday lights was absolutely beautiful! The next community league meeting is Tuesday, January 23rd, 2018 @ 7:00 pm at the SACL hall. Items for the meeting agenda must be emailed to secretary@spruceavenuecommunity.com in advance of the meeting. The cold snap has broken and SACL hopes to see you at the rink! Skating is free for all community league members. Memberships available for purchase at the rink/hall or by visiting https://efcl.org/membership/. Please note the rink closes when the temperature, with wind chill, is -20C or lower. For this last week of school holidays (January 2nd – January 7th), the rink will be open from 2-5pm and 7-9pm, with the exception of Wednesday (January 3rd)– when it will be open 2-5pm. Neighbourhood Renewal will start in Spruce Avenue in Spring 2018, bringing with it the opportunity for Decorative Street Lighting. As opposed to the current standard galvanized street lights, decorative street lights have features that include colour, pole styles, and pole arm types. It is an inexpensive, lasting way to beautify our neighbourhood. It demonstrates pride and community engagement. It is an opportunity to acknowledge our history and display heritage street names at no extra cost. Decorative street lighting presents the option for decorative street blades that include the historical street names (in addition to numerical name). Did you know that 112 ave was once called Spruce Avenue? In Spruce Avenue, the type of decorative streetlight for consideration is the heritage style, black, with octagonal base. This was determined via a community engagement survey taken at the SACL Open House in October, 2016. $10.62/m if paid lump sum, and $0.92/m if amortized over 15 years. A 44′ lot: $12.45/year ($1.04/month) or $143.77 paid outright. A 50’ lot: $14.15/year ($1.17/month)or $163.38 paid outright. Homeowners received an Expression of Interest letter regarding Decorative Street Lighting from the City of Edmonton in September. The deadline for returning this letter is November 15th, 2017. Please remember to send it in! Decorative Street Lighting is an initiative that is only offered through Neighbourhood Renewal, therefore, this is Spruce Avenue’s one chance for this program. If you have misplaced your letter, or have questions, you can contact Sue Buhler at suebuhler1968@gmail.com or Verna Stainthorp at spruceaveleague@shaw.ca or by calling 780-479-8019. 2-4 PM Saturday, January 21. 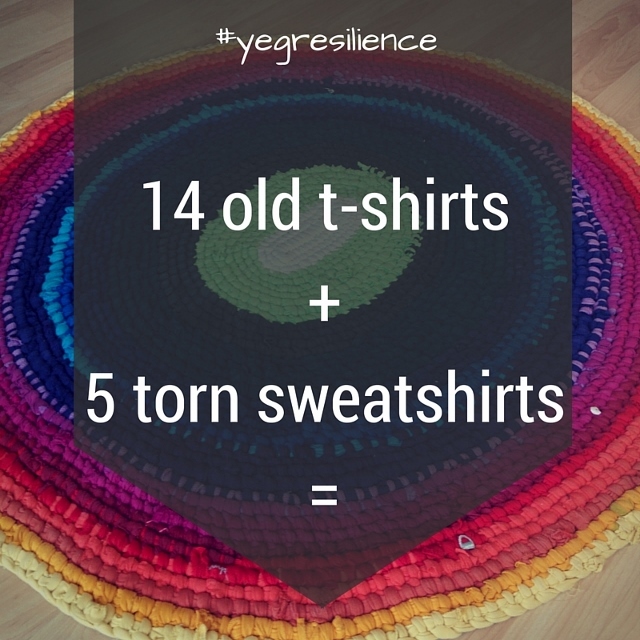 Bring whatever fabric you’d like to turn into rugs and a pair of scissors, if you can. Extra fabric and scissors will be provided.